Do you Play Buggle? Join GameHunters.Club our members share free bonus, tips, guides & valid cheats or tricks if found working. Check out the Buggle Bonus page to see the full list. If you need to add friends for gifting or exchanging game-items you can check or join the Buggle Add Me List. GameHunters.Club is a Fan Site and is not endorsed by or affiliated with Buggle. All Trademarks are the property of respective owners. If you love this game, support it by purchasing premium items in the game or follow the official Buggle social media channels. GameHunters.Club is a platform for gamers who loves to share. Join us and be the first to post here about Buggle. There is no registration required. Login with Facebook to start posting. Join the Forum, Discuss anything about Buggle. You can talk about tips, tricks, cheats, ask for help or simply introduce yourself to the club. These are the most recent topics and posts on Buggle Forum. Do you know any of this topics? Help players by posting about this topics on Buggle Game Post section. The newborn bird🐦, Daisy, is curious about many things. Which color is the center of this red bubble? (Hint : we have magnified the center for you! Please leave a comment💬 with your answer. Remember the colorfully painted egg🥚 that Andrew found in a forest? He brought it home and took good care of it, and a cute, small bird 🐦was born! She calls Andrew "Mommy" because he's 🐻the first thing she saw right after birth. He named her Daisy. Leave some nice messages for Daisy, who's new to this world. 🐻The new Buggle will be available soon!🐻 Want to see how much easier and faster 💨it's become? You won't have to wait long! Change your browser now, and we'll give you a load of gifts 🎁on the game's 🌟grand opening 🌟date! Hooray🎉! Andrew🐻 turns 6 today! To celebrate his birthday🎂 together, we have prepared a special event 🎁for you - we will give you one stamp a day when you play. Get 6 and Andrew will give you an appreciation gift! You have 14 days to complete it! Check it out 💖https://bit.ly/playBuggle P.S. We want to take this opportunity 🎁to thank you for supporting and playing Buggle🍯. It really means a lot to us and we sincerely✨ appreciate it. I know it's a little bit late, but happy New Year, everyone! What were your New Year's resolutions? Comment below! New Stage in Pengle! Where are you now? You can play up to level 2,760! ♥ Play Now! 👉👉👉 http://bit.ly/playpengle * From Developers : We are working HARD to bring you NEW PENGLE this month! See you soon! [Notice] Hello, We have fixed an issue that has been affecting the gate unlock system in Buggle. As an apology for all the inconvenience caused, we will unlock all the stages for free from August 1st to 7th. Thank you for all of your support. [Announcement] Dear Users! By August 2017, all Facebook fan pages for CookApps games will be merged into a central fan page: @CookApps Friends. This merging process will start next week, and continue throughout the following several weeks. With a central fan page for all of our games, all of our players will be able enjoy the same level of interaction and information from the game developers on the community page! We plan to offer more special benefits to our players for being a CookApps Friend! We ask for your patience during this merging process! Please feel free to contact the support team any time you have questions in the game. Out of lives? Your friends might be in the same situation! Give them a hand and send them a life! Play Buggle! With this plane I will be able to have all the honey that I want! But I need a co-pilot! Who's in? Want in? Click Like button! Running low in Honey! Will anyone help me get some more? What a lovely day for honey gathering! What is your favorite part of your home and why? Enter for a chance to win ★10,000 coins★ - Like (y) & Share ❤ this Post! Buggle Bear is all out of honey. :( Let's help turn that frown upside down by helping him get some more of his favorite treat! What plans do you have for 2017? Have you thought up any good resolutions for the year to come? If you have, share them with us here! Rise and shine! Hope today turns out to be a lovely day for everyone! Out of lives? Your friends might be in the same situation! If you help your friends, they will help you too! 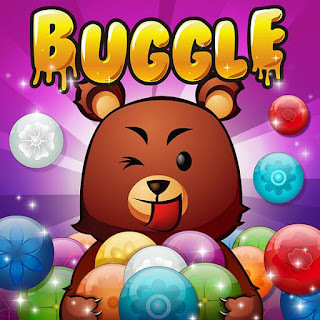 heart emoticon Play Buggle now🐻 - http://bit.ly/playbuggle — with Zumra Deumic Jakupovic. Play Buggle! Shoot colorful bubbles to collect honey and discover hidden treasures! Cookapps create games that let you play together with real-world friends and family using the infrastructure built by social networks.